I have wondered for a while now on the meaning of Jamavar. I now know. Jamavar is a very special kind of a shawl that is hand made in Kashmir. Each part of the shawl is painstakingly created such that the shawl looks the same no matter which side you turn. It takes a certain kind of perfection to achieve a result like that. 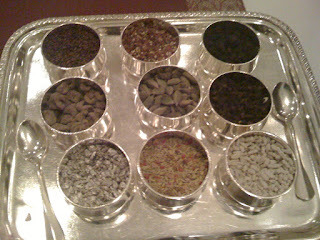 Leela Kempinski takes inspiration from this and hence the name Jamavar for their signature restaurant. This time round, Jamavar was playing host to chef Farman Ali who created an entire festival to showcase the authentic food of Delhi. We were invited to sample this meal and I was really looking forward to it. We chose to sit indoors since Bangalore has now turned real breezy. 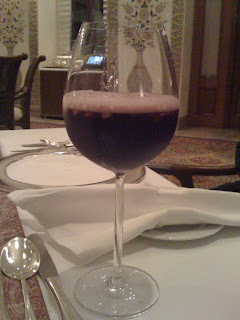 We were given our drink menus and I opted for the Sangria (red wine with a reduction of orange). It came in a lovely wide mouthed wine glass, topped with chopped apples and fruity and yummy! 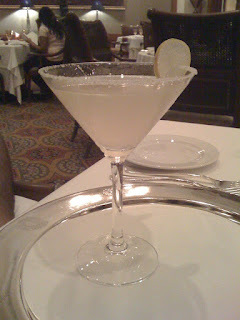 Sudhakar opted for the classic Margherita - served in a salt rimmed glass, this margherita packed one hell of a punch. Had half a mind of claiming both drinks for myself - but then hey! I had come to enjoy the food and not be carried out drunk. Each of these drinks came at a princely Rs 675. 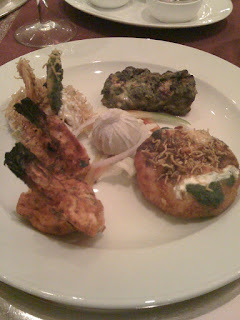 Since we were the chef's invitees, thanks once again to Bhavya, we were going to have a tasting meal. Out came the papad which was completely devoured by gastronome junior. Next came a round of starters. Each of our plates were laden with - malai jhinga (butter fried prawns with the tails still on), shammi kebab with a dollop of mint chutney, dahi bhalla in its true avatar, an alu tikka, hariyali chicken. The slice was lemon was thoughtfully wrapped in a potli to ensure that the seeds don't fall into your meal when you season it. 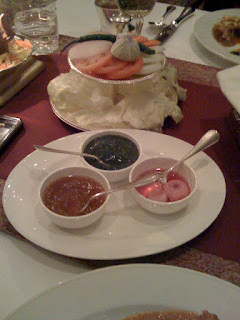 The prawns had been well marinated and for something that had been fried, was extremely soft. the shammi kebab was beautifully minced mutton with onions and a hint of garlic, scrumptious to the last bite. The dahi bhalla was great and coming from a person who does not like the dish personally, that is saying something, I would have asked for another of the alu tikka but I knew I wanted space for the rest that was to come. The Hariyali Chicken, was succulent, soft and pure eating ecstasy with each bite. Next came the main course. Fresh plates were put out and there came an assorted roti basket. 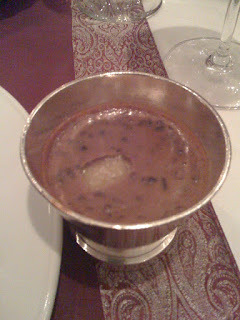 Each of us was given a brass katori with dal makhni topped with a generous blob of molten butter. 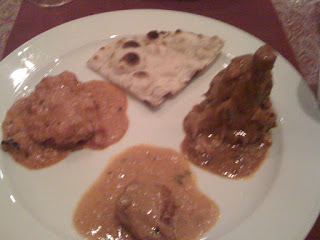 For the main course, we were each served - Murgh Mumtaz, a wonderfully tangy chicken, which had tomato at it base as well as a generous infusion of ground raisins which really heightened the taste of the dish. Macchi Urdu Bazaar wali which was a light gravy which pieces of boneless fish (not sure which fish). This dish was more on the bland side and did not really strike a cord with any of us. Also dished out was Ghosht Nihari and I was lucky enough to get my favourite marrow bone with the meat just melting away from the bone. This gravy was a dark brown with the chef's special mix of masalas. Heaven on my plate. 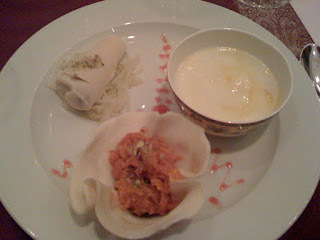 Each of our plates were laden with a bowl of phirni, kulfi with sweet semiyan and gajjar halwa in a biscuit mould. Kulfi is one of my favourite desserts and it has been a thing with me that in any restaurant, where it is on the menu and I have asked for it, it turns out that they would not have it for that day. So to see it on my plate was simply wonderful!!! 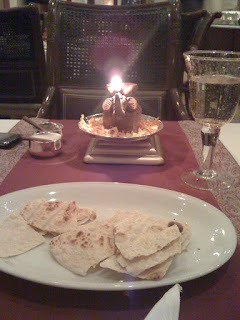 Thankfully, this was one meal that Anoushka really ate and enjoyed herself at. The fact that our wallets were not made lighter was all the more pleasing. Star restaurants have never really been able to please with their food, but having dined in two of Leela's restaurants, I must say that I take those words back. Things like this cannot be generalised.